There were 60 players who legitimately could have made my 2017 Tampa Bay Rays Top 50 Prospects back in January, and some now have. Others have graduated to the majors, some have dropped out of the Top 50 and more than a few are new to the list, having arrived in the draft, by trade or by outstanding performance. The son of a former minor league player for the Pittsburgh Pirates, Honeywell has excelled at every level since being drafted out of community college in 2014. He starred in the Arizona Fall League in 2016 and was the Most Valuable Player at the 2017 Futures Game in Miami. He has been dominant this summer at AAA Durham, striking out 147 in 118.1 innings and compiling an 11-8 record with 3.80 ERA. He’s ready for The Show and is our new top prospect. No longer the Rays’ consensus top prospect after a slow start at AAA Durham, Adames is a likely September callup and a possible regular in 2018. He was acquired in the David Price trade with the Detroit Tigers in 2014, played at age 20 and had an .802 OPS at AA Montgomery in 2016. He has 9 HR, 54 RBI, 10 SB and a .273 batting average at Durham after improving as the summer wore on. Bauers has a chance to be an everyday regular. He has 13 HR, 61 RBI and a .266 batting average at AAA Durham this summer. The first-round draft pick in 2017 out of college at Louisville — the fourth pick overall — looks like an everyday first basemen but he also could be a pitcher. Unusual for a two-way college player, McKay actually had scouts baffled as to which role he could best fill. The Rays are letting him do both, for now. In 29 games in the New York-Penn League he has 4 HR, 17 RBI and a .206 average. In 15 innings he’s struck out 18 and given up three earned runs. Short sample sizes but this is an intriguing player to watch. The Dominican Republic native exploded onto the scene as an 18-year-old in 2016, batting .323 in the Gulf Coast League and .347 in the Appalachian League. He’s continued to perform well this summer, with 15 HR, 78 RBI and a .305 average at Low-A Bowling Green. His future gets brighter and brighter. Obtained from the Dodgers in the offseason Logan Forsyth trade, DeLeon was expected to either succeed in the majors or be at the top of this list. But injuries have intervened. He has spent most of the summer rehabbing from arm issues. He’s appeared in 10 minor league games, striking out 44 in 38.1 innings with a 1.17 WHIP. He had one early MLB appearance that didn’t go so well. Just turned 25, he will have an opportunity to make up for lost time next year. Fox was the second Ray to play in the 2017 Futures Game in Miami and has performed well at both Low-A Bowling Green and High-A Charlotte this summer. His combined 2017 minors stats show 30 stolen bases, a .356 on-base percentage and 3 HR and 38 RBI. The native of the Bahamas was obtained from the San Francisco Giants in the Matt Moore trade. He stole 25 bases in 75 games in the South Atlantic League in 2016. He’s just 20. The Rays’ first-round draft pick out of high school in Marietta, Ga., in 2016, Lowe has hit well in full-season ball this summer. He’s notched 8 HR, 54 RBI and a .261 batting average with 22 SB at Low-A Bowling Green. He has the tools to be a big-league regular. Another teenaged international prospect is moving up the ranks here. The native of San Pedro de Macoris, Dominican Republic, home of so many big-league shortstops, hasn’t really hit yet in 195 minor league games. This year Rondon has 9 HR, 44 RBI and a .218 average at Low-A Bowling Green (those Hot Rods are a hotbed of Rays talent, having won 14 in a row at this writing). Franco was signed out of the Dominican Republic in July, generally held to be the top prospect among international signees this year. It’s a long way to the big leagues from there, but his father played professionally, as do two of his brothers now, and he is the nephew of big-league shortstop Erick Aybar. The Rays gave him $3.825 million to sign, so they think he’s a future major league shortstop. But he signed at 16, so wait and see. The second-round pick out of high school in the player draft in 2013 has the hit tool and developing power and turned heads in the Australian Baseball League and Arizona Fall League in 2016. But his stock fell a bit this season after he got off to a slow start and missed all of May with a knee bruise. He’s heated up since, however, and has 10 homers, 62 ribbies, six stolen bases and a .297 average in 88 games at AA Montgomery. The first-round draft pick out of high school in 2015 is finally making progress after being brought along slowly after a hamstring injury cost him an opportunity at full-season ball in 2016. He has plus bat speed but draft picks who go two seasons in short-season leagues generally don’t excel. His first year at full season Low-A Bowling Green has produced a .240 batting average, .348 on-base percentage and 13 HR, 55 RBI and 13 SB. Solid numbers for a 20-year-old at this level. He’s moved to the head of the line of young pitching prospects in the Rays system. Franklin looked good in his first year in the Gulf Coast League but has been even better at short-season Hudson Valley with 60 strikeouts in 58.1 innings, a 2.47 ERA and 1.25 WHIP. The third-rounder has a mid-90s fastball and a bright future. The 2012 first-round draft pick of the Oakland Athletics, Robertson was acquired in the Ben Zobrist trade. He has been an OK utility infielder this year, with good defense and insufficient offense. The jury’s still out on whether he can be a major league regular. A first-round pick out of the University of Arkansas in 2013, Stanek has earned time in the bullpen with the Rays this year. With a fastball topping 100, but limited command of it so far, his best chance to shine is as a future major-league closer. Schultz his a future bullpen piece, possibly a closer, given his strikeout totals — 163 in 130.2 innings at AAA Durham in 2016. But he is relatively small, 5-10, about 200 pounds, and his inconsistent release point remains a concern. This year he has been plagued by injuries. But when on the mound, he can turn heads. The strapping pitcher from Taiwan dominated AA in 2016 and has pitched well at AAA Durham in 2017, with 52 strikeouts in 58.2 innings and a 1.14 WHIP. He’s made a handful of appearances in the Rays’ bullpen but still has a chance to be a solid mid-rotation starter. Wood has been solid if not spectacular this year at AAA Durham and even pitched an inning in the majors. After moving methodically since being drafted in the 29th round in 2013, Wood had 49 strikeouts in 49.1 innings and a 1.14 WHIP at AA Montgomery in 2016. His strikeout totals have declined this year, and it remains to be seen if he can earn a starting job in the big leagues. The former University of Virginia batsman has showed flashes of power and speed and good plate discipline during his three years in the minors. He has 19 stolen bases and a .414 OBP at AA Montgomery this season, with six home runs. Drafted in 2015 out of Maryland, he has shot up prospect lists this season. He was a Florida State League all-star after hitting .311 with 9 HR, 46 RBI and 67 SB at High-A Charlotte. Since promoted to AA Montgomery, he has two homers, nine runs batted in, a stolen base and .265 average. A second-round draft pick out of the University of Nebraska in 2016, Boldt has played well in his first full season in the minors. He has a .358 OBP, 23 stolen bases and five homers and 59 RBI at High-A Charlotte. The South Carolina high school player of the year was a first-round draft pick in 2013. He has a cannon arm and great baseball sense. His hitting has picked up this year at AA Montgomery, with seven home runs. Potentially big power, but with lots of strikeouts, Padlo (acquired from the Colorado Rockies in the Jake McGee trade) has struggled a bit this year at High-A Charlotte. But it’s too soon to say he won’t figure it out and become a big-league regular. Drafted in 2015 out of Pacific, Sullivan was a Florida State League all-star this season and earned a promotion to AA Montgomery. He has 8 HR, 16 SB and a .298 batting average in combined stats in 2017. His ability to throw out runners is his best defensive trait. Obtained from Seattle in the Drew Smyly trade, Vargas is one of several young shortstops who are promising but too far away to accurately assess. He’s hit 12 HR. driven in 59, has 4 SB and a .243 batting average in 109 rookie league games over two seasons. Rutherford was a sixth-round draft pick out of Old Dominion in 2017. He has 7 HR, 34 RBI and a .326 OBP at rookie league Princeton this season. Walls was a third-round draft pick out of Florida State in 2017. He has five stolen bases and a .321 OBP at short-season Hudson Valley this summer. The Venezuela native could be a bullpen piece for the Rays some day soon though he has prospered as a starter this season at AAA Durham. He has 115 SO in 136 IP at Durham and a 1.00 WHIP. He may yet get a chance to show he can start in the majors. Obtained from Seattle in the Drew Smyly trade, Yarbrough has been a solid performer at both AA Jackson in 2016 and AAA Durham in 2017. This season he has a 13-6 record with a 3.51 ERA, 151 strikeouts in 151.1 innings and a 1.18 WHIP. Could be a mid- or back of the rotation starter. The Venezuelan struck out 85 in 70 innings at two stops in A level ball in 2016 and has 50 strikeouts in 49 innings this year, including 22.2 innings in the big leagues. Has a big arm and potential big-league and fantasy impact as a closer if he can command his pitches. Obtained from the Seattle Mariners in the Taylor Motter trade, Kelly can hit, has some power and steals bases. He has 9 HR, 67 RBI, 10 SB and a .313 batting average with .401 OBP in combined stats from 2017 stints at High-A Charlotte and AA Montgomery. He could really move up this list going forward. The second-round draft pick out of a San Diego high school in 2017 has great potential. He’s looked good in 18 innings of rookie ball. The Dominican’s live left arm could land him in the back end of an MLB rotation one day. He has performed well at High-A Charlotte and AA Montgomery in 2017, striking out 106 in 129.1 innings with only 51 walks. The product of the University of North Carolina has showed hitting skills in his first three seasons at Hudson Valley and Bowling Green and now Montgomery. He has swiped 18 bases in 2017 and plays multiple infield and outfield positions. His ability to get on base will determine whether he’s a future regular or utility player. But a recent 15 for 32 stretch in a nine-game hitting streak is promising. Burke has broken out this year with good performances at Low-A Bowling Green and High-A Charlotte. His combined record is 10-6 with a 3.07 ERA, 105 SO in 117.1 IP and a 1.19 WHIP. On track to be a back of the rotation starter in the bigs. Acquired in the Steven Souza deal with the Washington Nationals in 2014, the 6-4 lefty has a chance to be dominant on the mound. He’s 10-3 with a 2.19 ERA and 124 strikeouts in 111 innings with a 1.15 WHIP in A ball in 2017. A first-round draft pick in 2011, and considered the Rays’ top prospect after the 2013 season, Guerrieri’s star has fallen. He had Tommy John surgery in 2013, but then came back to have a solid year at AA Montgomery in 2016. He then fell in a bathtub and injured his head in spring training 2017. He had 12 strikeouts in 9 innings at AAA Durham with a 0.96 WHIP in two April 2017 outings before leaving with an elbow injury. There is no structural damage but months of rest have ensued. The clock is ticking on his career. The former Seattle Mariner made a modest contribution to the Rays bullpen tin 2017 and may continue to do so. Heim has started to hit this year (9 HR, 55 RBI, .257 batting average) in A ball and shows the defensive skills to suggest he could be a big-leaguer. Field, 25, had a solid season at AAA Durham in 2017 and projects as a possible fourth outfielder. He’s hit 10 HR with 51 RBI and a .256 average. Obtained from the Cleveland Indians in the Brandon Guyer trade in 2016, Lukes has competed well at both High-A Charlotte and AA Montgomery this season. He has a combined .276 batting average, three homers and seven stolen bases. A fourth outfielder is probably his ceiling. Drafted out of the University of Michigan, he batted .322 with an .865 OPS in 81 games at A-level Bowling Green in 2016. He followed that up this year with a .273 average and .724 OPS at High-A Charlotte and AA Montgomery. The brother of St. Louis Cardinals second baseman Kolten Wong had a solid 2016 at AA Montgomery and has hit well at AAA Durham, batting .273 with 13 stolen bases in 98 games there. He likely will be a utility player if he makes it to the majors. The Dominican native has a big fastball, strikes out more than one per inning and could slot into the bullpen for the Rays in due course. He has 83 SO in 68.2 IP at AA Montgomery and AAA Durham in 2017. The 2014 seventh-round draft pick from Florida International excelled in long relief at A-level Charlotte in 2016. His 73 strikeouts in 71.1 innings caught attention from the Rays brass. This year he has started and relieved at AA Montgomery and AAA Durham, striking out 76 in 87.2 innings with a 2.57 ERA and 1.24 WHIP. The former 35th-round draft pick from Florida State University has been used exclusively in the bullpen in the minors, where he misses bats. The lefty struck out 61 in 69.1 innings at AAA Durham thus far in 2017. Leonard has shown some power and speed in six minor league seasons, and has played first and third and outfield. He has 11 HR, 66 RBI and a .278 batting average at AAA Durham in 2017. Not stellar performance, but his utility may yet land him with the Rays, and he’s still just 24. A ninth-round draft pick out of Cal State Pomona in 2016, Bayer struck out 92 in 66 innings at Low-A Bowling Green so far in 2017. Bullpen ahead. A 27th-round pick out of the University of California in 2016, Tenerowicz surprised everyone with a solid season with the bat and in the field at rookie-level Princeton in 2016. In 2017 at Low-A Bowling Green, he has hit 11 HR with 35 RBI and a .367 OBP. Acquired in trade with the Arizona Diamondbacks, Velasquez has hit 8 HR with 36 RBI and a .304 OBP at AA Montgomery. Casey Gillespie, first baseman ranked #4 on this list in January, was traded to the Chicago White Sox for reliever Dan Jennings at the trade deadline in 2017. Jacob Faria, #6 on the January list, graduated to the majors where he has won a rotation spot with the Rays and pitched well in 2017. Austin Pruitt, #24 in January, also made the big club and has started and relieved for the Rays this season. Injuries blunted the seasons of a number of prospects on this list in January, including pitcher Kevin Gadea, OF Jake Fraley, 2B Ryan Brett, 2B Jake Hager and catcher Chris Betts. They could return next year if performance dictates. Performance cost spots on this list for relief pitchers Joe Serrapica, Jeff Ames, Greg Harris and Dylan Thompson, infielder Riley Unroe, outfielder Eleardo Cabrera and catcher Justin O’Connor. 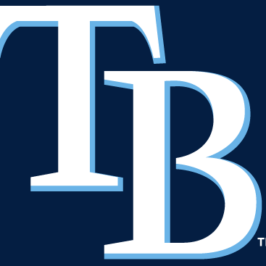 The Rays released Dayron Varona, a 28-year-old Cuban who wasn’t progressing to the majors.